Mother, the immortal classic of Maxim Gorky, gives a broad and generalized picture of life in Russia on the eve of the Revolution of 1905. Pelageya is the wife of a factory worker who ignores the political upheaval in her country in favor of caring for her personal life. She represents hundreds of workers who are concerned with living their lives. Her son Paval takes a different path and joins the revolution inspiring many Russians who were living under a capitalistic society in Russia. She also takes an active participation in her people's struggle for justice. Through her work, she frees herself from the cowed state into which she has been beaten, and her simple motherly concern for her son becomes a motherly concern for all oppressed. I am a proud mother of two daughters. Sometimes I think we three are friends and often exchange our ideas and secrets with each other. One day, my eldest daughter, Ria came home with one of her School Library Book named, 'Mother' by Maxim Gorky. She suggested me to read the book and to tell her how I feel. Since, I complained about the boring house chores, my daughters are sometimes my Guardian Angels, the Two Saviors, not to tell that sometimes they act like mothers to me even. It took me one whole week to finish up the book. Guess what! My heart swelled with joys and pride and I immediately became a great fan of Pelageya, Paval's mother. Her struggles throughout her life and her love, care, and perceptive for her son, Paval were very overwhelming. She is a great supporter of her only son. I think that every mother would be very proud of her child's courageous acts. As a mother, I know how very difficult it is to deal with uncertain circumstances. The second part of the book had a climax when Paval was arrested for leading the May Day demonstration. Since, the struggles, agitations, and the aggressiveness of Paval was shown through his mother's feelings and views, I will vote for Pelageya as well as her son, Paval as being the major active participation in the Russian Revolution of the period, who fought against the Tsarist Law and Politics. Till date, this book has been my favorite, and I too recommend that it is a Must Read book. According to me, Paval's mother has also played the major role in the active participation in the oppressions. She also has been the strong and courageous female character throughout. Though Paval has his bigger share in playing the main role, his mother, Pelageya has been the shadow figure as well as the inspiration for her son and all other worker class people as well. Aleksey Maximovich Peshkov, better known as Maxim Gorky was a Russian and Soviet author. He was a founder of the socialist realism literary method and a political activist. From 1906 to 1913 and from 1921 to 1929 he lived abroad, mostly in Capri, Italy; after his return to the Soviet Union he accepted the cultural policies of the time. Gorky's collection of short stories Sketches and Stories (1898), published by a radical press, and established him as a favored revolutionary voice for the people. He married Ekaterina Pavlovna while working for the Samarskaya Gazeta. Foma Gordeyev (1899) was his first published novel. Gorky also wrote numerous plays, often preferring characterization over plot. After his famous play The Lower Depths (1902) was released he spent a number of years in exile including travelling to the United States in 1906 to raise funds for the Bolshevik Movement. He himself had been arrested a number of times for his political activity though his popularity saved him from the most severe punishment. 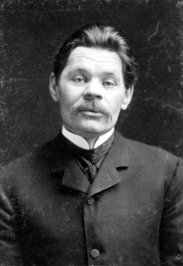 Maxim Gorky died on 18 June 1936. There is some speculation that he was poisoned to death on orders by Stalin. His ashes are interred in the Kremlin Wall in Moscow, Russian Federation.